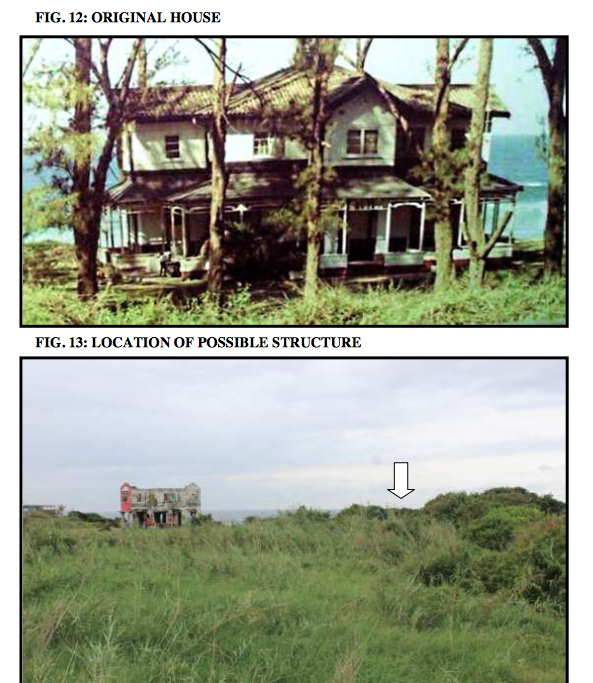 Less than a week after publication of a heritage impact assessment (HIA) on an iconic haunted ghost house on the M4 near Durban, the building was razed to the ground. The demolition was ordered by the local eThekwini Council that had previously demanded the owner, Saantha Naidu Group of Companies, either restore the building or bulldoze it because it wasn’t safe. 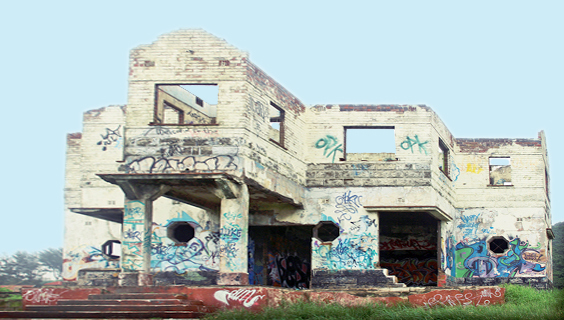 The landmark house had been progressively stripped by vandals, and whilst a famous ruin, had been abandoned for more than two decades. 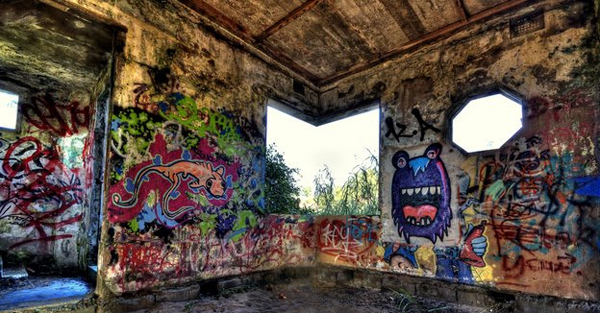 At the time of the demolition, it was simply an empty shell famously decorated with graffiti both inside and out. It took bulldozers less than an hour to tear down the remains of the structure on June 9, and by early this week all rubble had been removed. 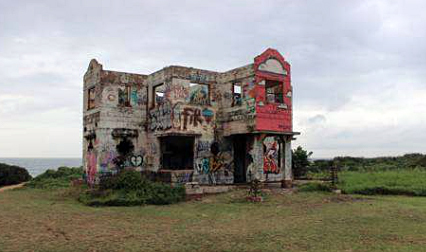 Even though Saantha Naidu has consistently told reporters there are no concrete plans for developing the property, an HIA dated 31 May 2016 states that there are plans to build an hotel on the site of the “existing ruin,” and hints that it could be called the Ghost House Hotel. Titled The Tongaat Coastlands Hotel HIA, the study was undertaken by Umlando, Archaeological Surveys and Heritage Management company on behalf of environmental consultants, Triplo4 Sustainable Solutions. It included a palaeonotological impact assessment, and defined the significance of the site archaeologically. A prime factor was to determine how old the ghost house really was, since houses older than 60 years cannot be destroyed without a permit issued by the Amafa aKwaZulu-Natali Heritage Council. The story of the historic haunted house is relatively well known, although there is some dispute about when it was constructed, and exactly where an older wooden house was located. What is known for sure is that the house was built by a wealthy South Indian businessman Gurusamy Veerasamy Naidu, who arrived in Durban in the 1920s on the same ship as Mahatma Gandhi. GV Naidu, as he was better known, bought 100 acres of land near Tongaat’s Casuarina Beach and built a single-storey wooden house there in 1926. Although several newspaper reports based on Naidu family hearsay state that the house was later added to, or a larger double-storey brick house built in its place, the HIA states that there were two separate houses, built in different places. Furthermore, the photograph of the “original house” in the HIA is double-storey, suggesting that the original wooden house had a second storey added to it (see picture below). Aerial photographs taken in 1937 prove that the brick house did not exist at that time. They also identify two structures that might indicate where the original wooden house was built. In addition, a 1969 map researchers sourced shows the position of the brick house. The author of the HIA report, Gavin Anderson, believes this confirms that the so-called ghost house was built either in the 1950s or 1960s, which would make it more or less 60 years old. If over 60, it would “be protected by the KZN Heritage Act,” he states in the HIA. Since his report was dated little more than a week before the building was demolished, it is doubtful whether his findings were even taken into account. In any case, the brick house is believed to have been the first in the area with electricity. It also boasted a water pump and a telephone, and was undoubtedly “lavish.” It is said to have had six bedrooms, a couple of lounges, two kitchens, two beautiful Victorian-style bathrooms, and featured beautiful stained glass windows. GV Naidu didn’t live here full time, as he had palatial homes in Umbilo and Tongaat, as well as the beach house. His son, also Gurusamy, lived there with his wife until his death in 1994. When his widow moved to the Berea, the house was left unoccupied, but fully furnished. Within a month all the furniture had been stolen and the stained glass windows removed, along with other fixtures. In its heyday, the house was the venue for social occasions, not only for the Naidu family, but also many famous visitors from India. It was also used as the set for several film and movie shoots. It is not certain why the house earned the reputation of being a ghost house, because nothing significantly bad is known to have happened there. Nevertheless, the ruins captured the imagination of people, and there were ongoing rumours that something horrific happened there in the past, and that the victims came back to haunt the house! According to the HIA the land on which the ghost house was built was originally surveyed in the early 1880s and later incorporated into the Township of Tongaat. A consecutive desktop study found that there were two possible places that could have been the site of the original house. However it noted that it was unlikely any part of the wooden structure would still be intact. If middens could be linked to the original structure, these would though be of interest, the study stated. The area thought to be most likely was inaccessible because of dense vegetation at the time of the study. The building is currently a ruin and will be a safety hazard shortly. There is no justification to keep the existing house on any heritage terms. Ultimately, the study found that the house was of “low significance,” which probably explains why there was no delay when it came to the demolition order – even though the report stated that a permit “might be required” depending on the age of the house. The Palaeontological Impact Assessement for the HIA was undertaken by a highly specialised independent consultant, Dr. Gideon Groenewald. He found that the area has a “very high palaeontological sensitivity” in terms of fossils, and recommended that a qualified palaeontologist monitor all excavations deeper than 1,5 m on the site. This of course could have a major impact on future development of the property. Together with this, the HIA also stated that an archaeologist would need to be on site to monitor excavations during any new construction process. Current owner of the iconic ghost house property, Saantha Naidu follows in his grandfather’s footsteps, with a property portfolio that exceeds R1 billion. Just over a year ago he added the legendary Royal Hotel in Durban to Coastlands Hotels & Resorts, for which he paid R78 million – considerably less than the R120 million starting bid the auctioneers were hoping for! A father of four who lives in Morningside, Durban, Naidu is understood to be an ANC “funder” with close ties to President Jacob Zuma.